Although we haven’t had the pleasure of trying this delicious sounding e-juice yet, I Love Donuts from Mad Hatter has been getting a lot of buzz around the vaping community. It’s a mix of fresh blueberries with sugary pastry notes; described as a true all-day-vape that tastes just like a freshly baked blueberry donut. 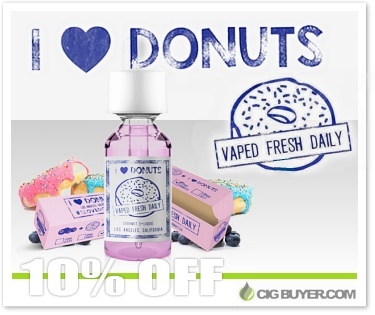 I Love Donuts comes in 30ml bottles at 60/40 VG/PG to deliver thick clouds of vapor without compromising flavor. Each bottle is packaged in a mini, donut-style box.